JP 2007-11-13 600 points ? US 2007-07-02 600 points ? EU 2007-07-06 600 points ? 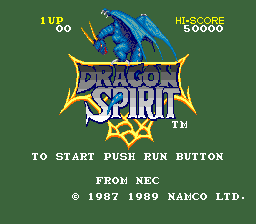 Dragon Spirit (ドラゴンスピリット) is a vertical scrolling shoot-'em-up originally released by Namco for Namco System 1 arcade hardware in 1987. A year later the company brought it to the PC Engine in Japan, and in 1989 it was released for the TurboGrafx-16 in North America. Character Design: Macchan, Arakawa Da! Main article: Dragon Spirit/Magazine articles. This page was last modified on 23 December 2018, at 06:13.